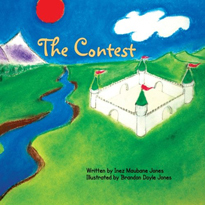 Inez Maubane Jones is the author of The Contest (2014), a beautifully illustrated children's story. When a contest is held among the animals living in a little kingdom, Page Sheep, Lady Spider, and Peddler Fox all try to win and receive the Special Secret Prize. Says one reviewer: "Inez Maubane Jones has managed to deliver an important message of self worth, empathy for others and searching and using what you're good at to help others. A simple storyline, with timeless lessons for all children."